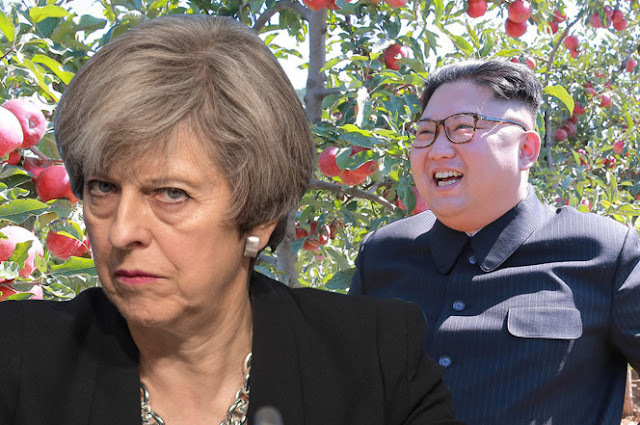 Britain is preparing for all-out war with North Korea — amid concerns that the escalating tensions between dictator Kim Jong Un and President Trump could spiral out of control, according to a report. Among the plans being mulled is the deployment of the Royal Navy’s newest aircraft carrier, the 65,000-ton HMS Queen Elizabeth, before it has undergone flight trials. “We have plenty of ships to send … the Type-45 destroyers, the Type-23 frigates. Britain’s new aircraft carrier could be pressed into service early if things turn south,” a senior Whitehall source told the Daily Mail. The HMS Queen Elizabeth, which is conducting sea trials in Portsmouth, is not due to enter service until 2020. Plans to deploy it ahead of schedule drew comparisons with the start of the Falklands War. On Tuesday, the rogue regime will mark the anniversary of the founding of its ruling party, and it is feared that Pyongyang will mark the occasion by launching another missile. “Our country has been unsuccessfully dealing with North Korea for 25 years, giving billions of dollars & getting nothing. Policy didn’t work!” the president tweeted Monday morning. On Saturday, he cryptically tweeted about decades of failure by previous administrations in getting the regime to curtail its weapons program. “Presidents and their administrations have been talking to North Korea for 25 years, agreements made and massive amounts of money paid . . . hasn’t worked, agreements violated before the ink was dry, makings fools of U.S. negotiators,” he posted. In return, Kim said his regime’s nuclear weapons serve as a “powerful deterrent” that guaranteed his country’s sovereignty. He also downplayed the effects of UN sanctions by claiming the North Korean economy is strong.